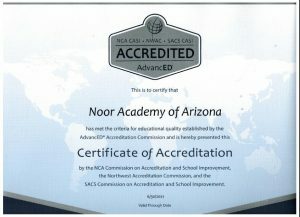 Alhamdulilah Noor Academy of Arizona is nationally accredited by AdvancEd. AdvancED is the largest community of education professionals in the world. Insh’Allah we will continue to strive to develop the practices of NAA and hold it among the leading Islamic schools in the nation.